This recording has the same programme as the concert in St John’s, Smith Square in October 2015. The CD was recorded a few days after the concert, in the church of St Mary the Virgin and St Mary Magdalen in Tetbury, Gloucestershire, but has only recently been released. The acoustics of this large Gothic church (with its wide nave and tiny side aisles) are more generous than St John’s, Smith Square, giving an added bloom to the sound, although the spacing of the musical forces sometimes gives more of a sense of distance that the more compact London stage avoided. Unlike the concert performance, the CD opens with JS Bach’s 1733 reworking of his earlier E flat version, written for his first Christmas in Lübeck in 1723. It is given a forthright performance without the irritating gaps between movements that I mentioned in the concert review. Johann Christian (the ‘London’) Bach’s 1760 Magnificat a 4 in C Major was written during his early years in Milan (where he was cathedral organist) shortly before his conversion to Catholicism. It adopts the Italian operatic tradition with occasional Classical hints. It has just five movements, lasting just over 10 minutes, rather than JS’s eleven movements in nearly 26 minutes, and CPE’s 40 minutes. The chorus is prominent often accompanied by bustling orchestral texture. Father Bach’s influence is evident in grand final fugal Et is saecula saeculorum. It was well worth performing and recording, although it is unlikely to achieve much acclaim. 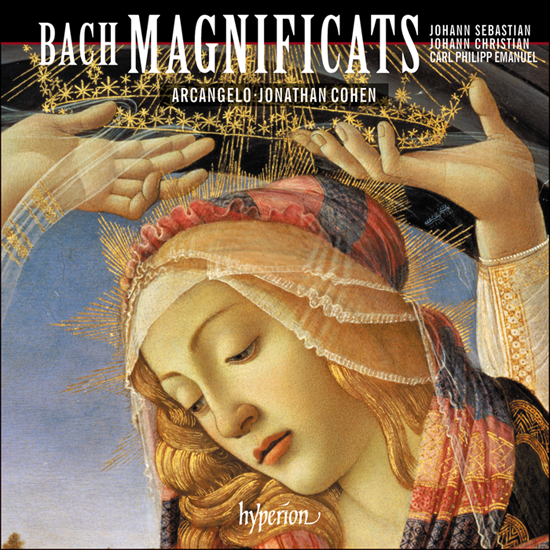 What makes this recording particularly interesting is the concluding Magnificat in D (H.772) by Carl Philip Emmanuel Bach. It was written in 1749 in Berlin, and revised in 1779, the version recorded here, but retaining the 1749 version of the Et misericordia. It has been suggested that this was originally intended a possible calling card for CPE’s return to Leipzig after his father’s demise. It was certainly intended to make an impression. Although elements of the tradition of his father are evident, CPE uses a broader musical spectrum and a greater sense of the drama of individual sections, albeit with a similar sense of the text. For example, where JSB sends the empty away with a delightful little plonk from the continuo bass; CPE hurls the mighty from their seat as if from a great height in a flurry of descending notes, before gently filling the hungry with good things. If I were the Father, Son and Holy Ghost, I would have been particularly chuffed with the ebullient Gloria, a glorious paean of praise of the sort that God seems to demand. The glorious extended fugal Amen is a movement that father Bach would have been proud of. Of the soloists, it is inevitable that countertenor Iestyn Davies will take the honours for the clarity of his voice, and his ability to shade the vocal line and to incorporate subtle ornaments into the melodic flow. Tenor Thomas Walker and baritone Thomas E Bauer also impressed, the latter particularly in CPE Bach’s blustering Fecit potentiam. As with the concert, I have concerns about the operatic vibrato (and other mannerisms associated with a much later repertoire) of the soprano soloist and, to a lesser extent, the mezzo soloist and some of the chorus sopranos. To me, this seemed out of kilter with the period instrument and performance practice credentials of a group like Arcangelo. With the occasional exception just noted, the 19-strong choir otherwise make an impressively strong and coherent sound. Of the instrumentalists, Alexandra Bellamy, oboe, made a significant contribution as did the continuo team of Ashok Gupta, harpsichord/organ, Luise Buchberger, cello, and Judith Evans on double bass. Jonathan Cohen directs with a combination of punch and precision, although, as mentioned, there are a few questions about the forces that he chose to engage for this project.